The King is shown holding a sceptre and looking towards his left. He wears a cloak lined with ermine (a white fur), the Chain and Order of the Garter, and a long curling wig. 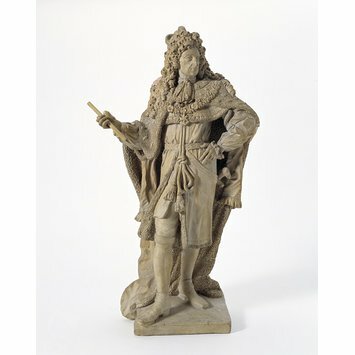 It is thought to be the original model for the lifesize stone figure of William III on the Royal Exchange erected in 1695. The statue has since been lost, following a fire at the Exchange of 1838. John Nost Nost (1686-1710) was a native of Malines in The Netherlands. He is first recorded in England around 1678, working at Windsor Castle under Hugh May. His workshop was in the Haymarket and he specialised in lead figures, though he also worked in other materials, such as stone and terracotta. 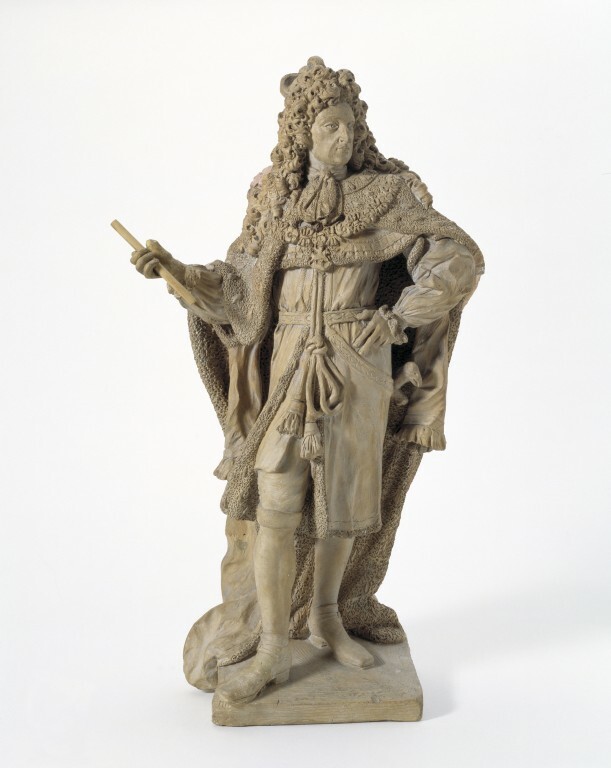 He had many important patrons and was commissioned to make a number of garden figures for great houses and palaces, including Castle Howard and Hampton Court Palace. Terracotta (baked clay) was commonly used for sculptors' models. The clay could be modelled freely before firing, and when fired was a durable material which could be painted or scaled up into a larger piece. Often, as must have happened with this piece, the terracotta model was valued on its own account. Statuette, terracotta. The king is represented standing looking towards the right. His left hand is on his hip and his right (a restoration) is raised and probably originally held a baton. He wears a long loose fur-lined tunic held in at the waist by his sword belt. Over this is a fur-lined cape and a mantle held by long cords knotted in front. A long curling wig falls over the shoulders and a plain lace cravat is knotted round the neck. The back of the figure is a plaster restoration. Modelled in England by John van Nost (possibly born in Mechelen, The Netherlands, active in England from about 1678, died in London, about 1712). Purchased from Montague Marcussen Ltd, Antiques & Works of Art. 98 Crawford Street, London, in 1939, for £25. It was on long-term loan to Historic Royal Palaces at Hampton Court from 1992-1999. Whinney, M. Sculpture in Britain 1530 to 1830. (revised by J. Physick) London, 1988, p.445, note. 68. Smith, N. 'Great Nassau's Image, Royal George's Test', The Georgian Group Journal. VI, 1996, p.12, p.21, note. 4.